On the afternoon of June 7, a workshop entitled “Collation and Composition in the Fifteenth Century” was conducted by Dr Paul Needham in the Sir Geoffrey Keynes Room, a perfect place for this special occasion. 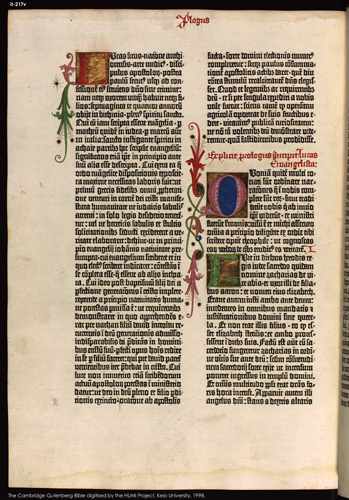 The main topic of this workshop was, as the title reveals, the collation and composition of incunabula. 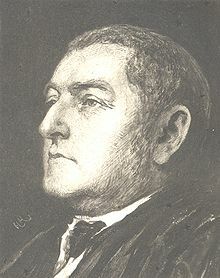 Borrowing Dr Needham’s words, it was a most timely topic for this workshop, for 2011 marks the 150th anniversary of the “invention” of the collational formula by Henry Bradshaw (1831-86), an eminent bibliographer and librarian with a deep connection with Cambridge. The collation is essential for us to learn, and most of us probably learned about it in foundational texts such as W. W. Greg’s “Formulary of Collation” (The Library (1934), 4th ser. XIV. no. 4), Fredson Bowers’ Principles of Bibliographical Description (1949; repr. 1994, etc.) and Philip Gaskell’s New Introduction to Bibliography (1972; corrected ed. 1974; paperback ed. 1995, etc.). Needless to say, bibliographers are trained to describe a book using the collational formula. It is an essential but not an easy task. I cannot help asking myself how much of my life I have spent counting the number of leaves in books. Of course, counting matters in the book world, but Dr Needham raised a further essential question: What, then, is collation? Why does it matter? In this workshop, we were awakened by this fundamental question, and through his wonderfully clear talk, together with stunningly beautiful books, we were able to see how much collation can reveal about the composition of a book, which provides new insights into the actual process of early printing. First, Dr Needham pointed out that few people described the concept of collation and also that little acknowledgement was made of Bradshaw’s invention. Using Bradshaw’s handwritten memo on the collation of a mid-15th century manuscript in the Scheide Library, Dr Needham emphasized that Bradshaw’s method could reveal the physical composition or structure of a book in a simpler but clearer way than those proposed by scholars after him, such as Greg and Bowers. 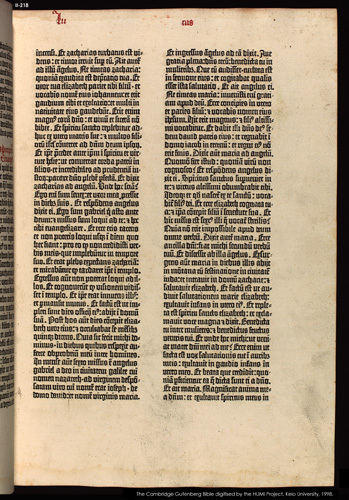 Then, he showed an example of the collational formula, using the CUL copy of the Gutenberg Bible (B42) [ISTC ib00526000], i.e. Inc.1.A.1.1. Of course, it does not mean that Bradshaw’s method can solve anything; there may be some limitations (and in the midst of the workshop, it was hotly argued whether there was any perfect method that could both describe the collation of an ideal copy and record the physical condition of a copy at hand, such as a lack of leaves, in a single and clear form). However, it has certain merits, for example, making a singleton leaf in a quire explicit. In a bibliographical study, such an anomaly may reveal something about book production, and Dr Needham presented the case that the blank page of the singleton in quire 25 of the B42 might explain something about the editorial decision (or hesitation?) to include the apocryphal chapter 4 of Ezra, using a handout of the collation formula handwritten by himself. Indeed, to collate a book, we need not only to count the number of leaves, but also to scrutinize the book itself. Then, we might get a chance to find what has not been unearthed over hundreds of years, as Dr Needham did. In the last part of the workshop, he told of a wonderful episode concerning his discovery of an exemplar, as if restaging it, using the actual books he had examined. More than two decades ago, he found that “#” marks appeared regularly in the CUL copy of the B42 and further identified that they matched the page breaks of the third of the Vulgate editions printed in Strassburg by Heinrich Eggestein, c. 1469 [ISTC ib00533000], a copy of which is Inc.1.A.2.3 in CUL . This means that the “#” marks were addedby compositor(s) in Eggestein’s printing shop in Strassburg and the CUL copy of the B42 served as the copy-text for Eggestein’s edition. In fact, this observation matched a study on illumination by Prof. Eberhard König, who proposed that the CUL copy of the B42 had been illuminated in either Basel or Strassburg. In early printing, there survive only a few books whose copy-texts have been identified, and it is therefore amazing to find such an example among monumental books like the B42. What I have summed up here is only part of the talk. 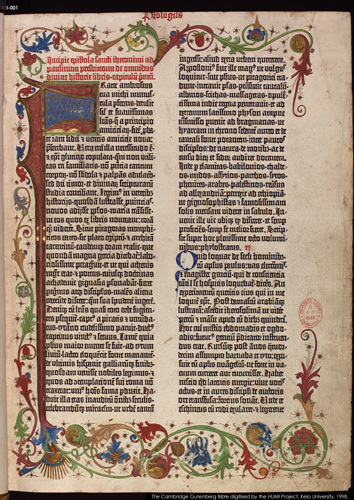 For example, details about Dr Needham’s discovery of the CUL copy of the B42 being used as a copy-text can be found in his article “A Gutenberg Bible Used as Printer’s Copy by Heinrich Eggestein in Strassburg, ca. 1469”, Transactions of the Cambridge Bibliographical Society, 9 (1986). On Henry Bradshaw, see his The Bradshaw Method: Henry Bradshaw’s Contribution to Bibliography (1988). After listening to his talk, I can vividly envisage what he explains in his articles, and above all, I find more joy in collation than ever before. It is all thanks to his well-organized talk and the preparation by the staff of the Rare Books Room. Indeed, it was really wonderful to have the original materials, and it was generous of the organizers to allow attendees to freely examine them during and after the workshop. Moreover, questions from the attendees were fascinating (and the size of the group was perfect for that), though they sometimes interrupted the flow of Dr Needham’s talk. Nevertheless, he gave deliberate thought to answering all of them, always getting his talk back on track beautifully. While writing this, I am still excited that I was able to be there, and I am sincerely grateful to Dr Needham and the staff of the Munby Rare Books Room for organizing the workshop. I am looking forward to future occasions! 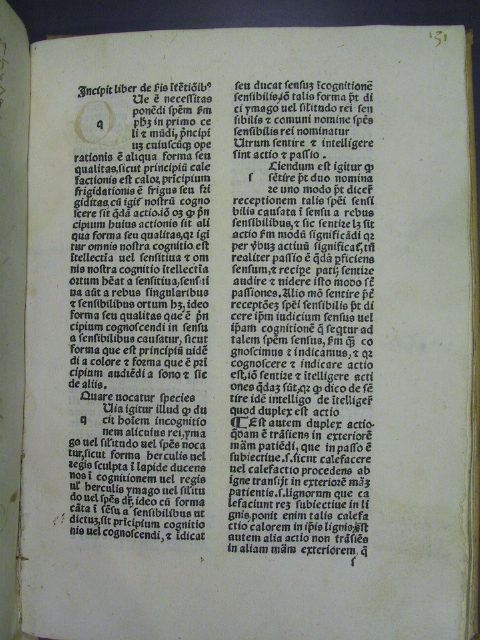 An unknown edition of the Liber de secundis intentionibus by Francesco da Prato ? This text is seemingly identifiable with the Liber de intentionibus by the 14th-century Dominican friar Franciscus de Prato. The readings of its incipit and explicit correspond to those published in Jean-Pierre Rothschild, Bibliographie annuelle du Moyen Age tardif, 11 (2001), no. 1129, as the beginning and the end of a treatise attribuited to Franciscus Pratensis in Madrid, Biblioteca Nacional, MS. 3368, fols 70 recto-80 recto. 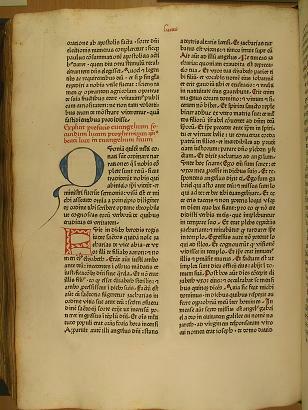 These readings also match the incipit and explicit of the already known edition of Franciscus’s text printed on leaves v2 verso-v6 recto of Johannes Versoris, the Dicta super septem tractatus Petri Hispani, edited by Petrus de Sancto Johanne and published in Venice by Hermannus Liechtenstein on 22 May 1487 (ISTC iv00238500; see GW M32404). 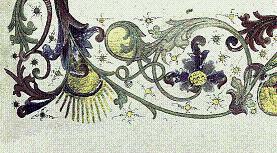 Franciscus’s treatise was later reprinted in Seville in 1530 and survives in four other 15th-century manuscripts. If the identification of the anonymous text is correct, there are two more lingering questions: the attribution of the printing to Pachel and Scinzenzeler rather than to Johannes Antonius de Honate, and the dating of the book to around 1481-83 instead of circa 1488 (as suggested by BSB-Ink V-181). 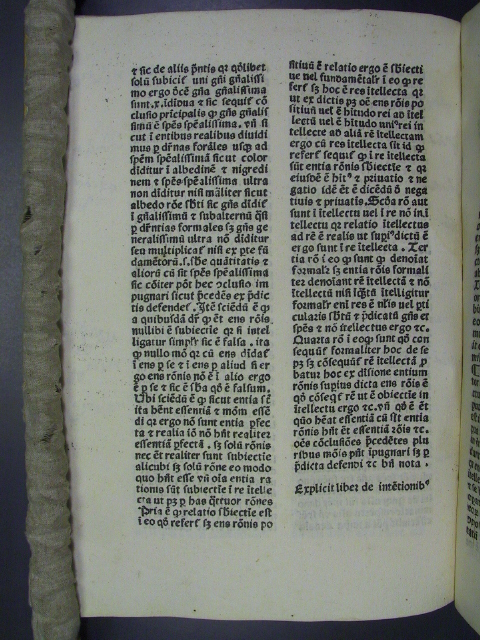 Only the carefull consideration of the types used in the edition and the philological comparison of the text with the surviving manuscripts copies and the 1487 edition will answer the final question: it this the editio princeps of Franciscus’s Liber de intentionibus? Fabrizio Amerini, “La Quaestio Utrum subiectum in logica sit ens rationis e la sua attribuzione a Francesco da Prato. Note sulla vita e gli scritti del domenicano Francesco da Prato”, Memorie Domenicane, n.s. 30 (1999), 147-217 (p. 211). Fabrizio Amerini, “La figura e la filosofia di Francesco da Prato”, in Dal convento alla città. Filosofia e teologia in Francesco da Prato O.P. (XIV secolo), Atti del Convegno Internazionale di Storia della Filosofia Medievale, Prato, Palazzo Comunale, 18-19 maggio 2007, ed. Fabrizio Amerini, Firenze, 2008, 15-29 (p. 17 and n. 8).